The makers of the popular Zen Pinball series on PlayStation Network and the Pinball FX 2 series on Xbox Live Arcade will bring the silver ball to the 3DS with Zen Pinball 3D, a downloadable title releasing this fall on the Nintendo eShop. Zen's news release mentioned four original tables will be available at launch—Earth Defense and Excalibur, seen in Pinball FX 2 on the 360, and newcomers Shaman and Eldorado. 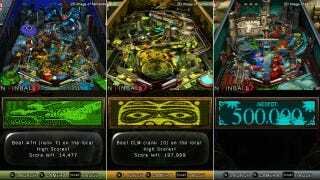 Zen Pinball 3D will feature local hot seat multiplayer, online leader boards and table rankings, multiple view points and rewards for playing and accomplishing table specific missions, which all are features familiar to players of Pinball FX 2. "Pro Score," an individual's collective score across all table, will be tallied in addition to a "Team Score" comprising one's friends' scores. Zen's 360 game is well known for its licensed virtual pinball tables such as its Marvel Comics series, but none were mentioned in the 3DS title's launch announcement. Still, releasing over the eShop keeps the door open for additional tables, whatever their branding. "Playing pinball in 3D is killer, it's like the game has been totally reinvented, and a whole new world opens up right before your eyes," Mel Kirk, Zen's vice president of marketing and public relations, said in a statement. No specific price or release date was given for this fall, but Zen did release this batch of 13 screenshots. Zen Pinball 3D's title screen.